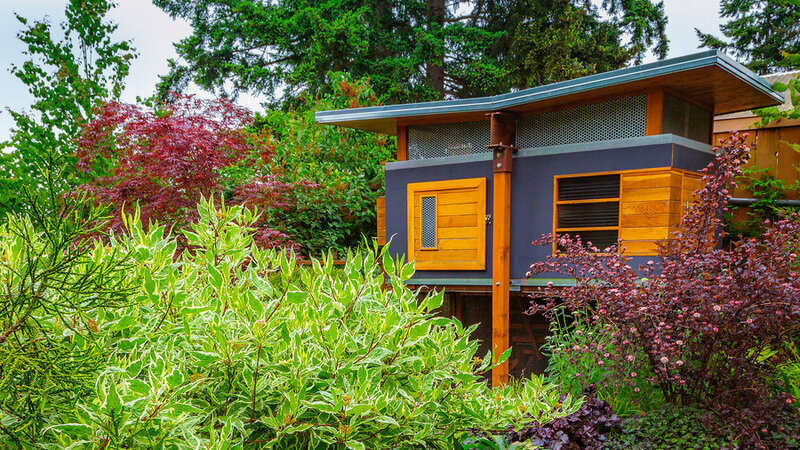 While Zach Galbraith was busy unpacking boxes after moving into a Burien, Washington, house in 2006, wife Manda was outside planning the garden. At the time, it was covered in invasive blackberry brambles, English ivy, and weed-laden grass. “I wanted something bright,” Manda says, “something alive with color.” At the nursery, she reached for plants with lime or purple foliage, drawn to the way the complementary colors pop. 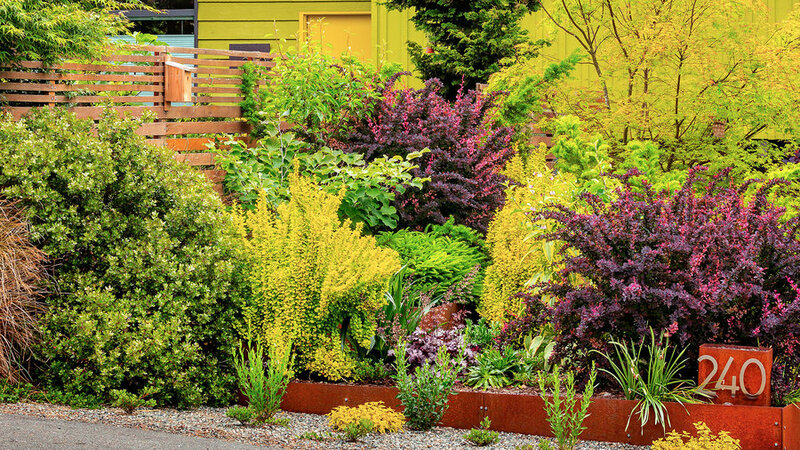 Manda lets all the colors of her garden play together by going easy on maintenance and allowing foliage to overlap. “I don’t shear anything,” she says. “I prefer things on the soft and relaxed side.’’ Zach executes her hardscape designs, trolling scrap-metal dealers for supplies. He’s used rock-sorting grids for a grape arbor and clematis trellis; made flower beds from steel plates; and built a shed and henhouse from cement board, wood, and steel. Gravel around the entries is salted with bright recycled glass. Design: Manda Galbraith, Flora & Bee, Burien, WA; . Flanking a ribbonlike gravel path, this tall fescue meadow mimics an impressionist masterpiece. 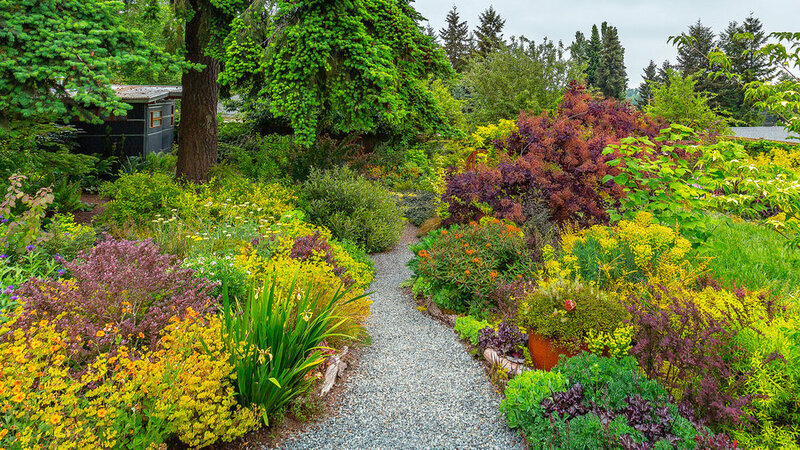 Patches of mauve (‘Royal Purple’ smoke tree); bright chartreuse blooms of Euphorbia characias wulfenii; and daubs of gold and lime plants hold it all together. A cherry branch hangs from the carport eave, with dried allium flowers dangling from it. 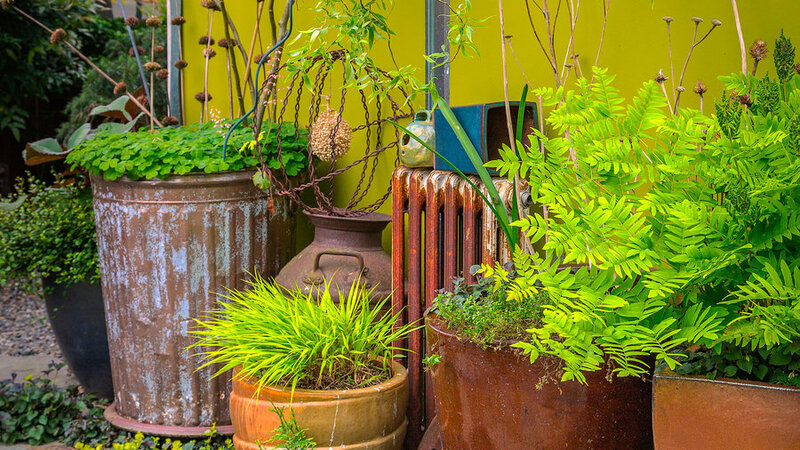 Potted plants and found objects (a milk jug, steel globe frame, and rusted radiator) create a fetching scene where a concrete walk once ran. Mixed groundcovers in varied shades of green soften the pavers in front. The lime green faux wall, made of cement board, screens off the carport. An elevated henhouse shelters a small flock of chickens. A red ‘Suminagashi’ Japanese maple is at its left, while ‘Diabolo’ ninebark screens it on the right. The broad leaves of ‘Heart and Soul’ hosta (center) stand out below variegated ‘Ivory Halo’ Tatarian dogwood and above ‘Ogon’ Japanese sweet flag and darker Corsican violet. A dwarf Japanese cryptomeria stands at left. 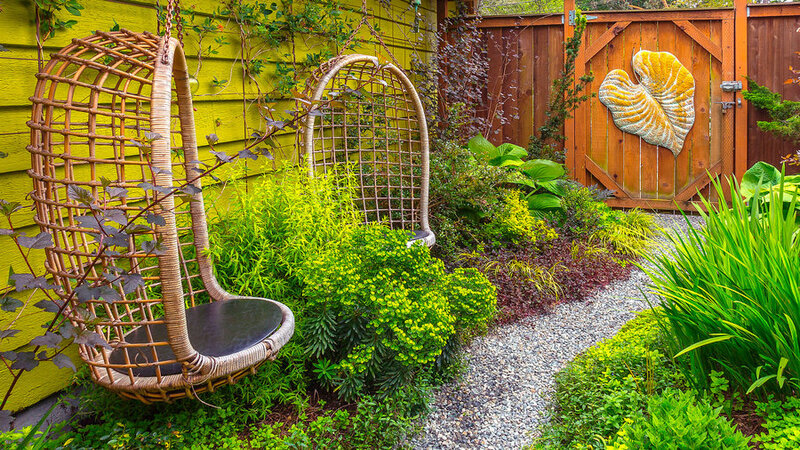 A narrow side yard, previously just a thoroughfare, becomes a super-sweet hideout for two. Hanging rattan chairs, acquired at an estate sale, float over the garden. The chairs face west, out of the morning sun, making it the perfect spot for Manda to enjoy her coffee when the weather allows. A leaf sculpture, rescued from a thrift shop, leads the eye to a gate that opens into the front garden.